Congratulations to Bea L., winner of the tour prize and to Romance Novel Giveaways, the host winner. 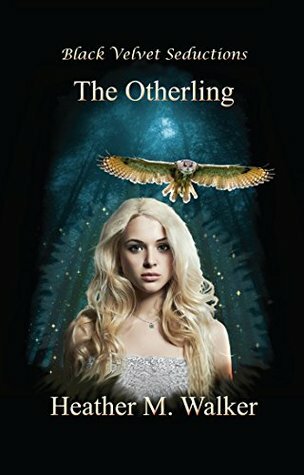 Goddess Fish Promotions is organizing a Virtual Book Tour for The Otherling by Heather M. Walker, a Paranormal romance available now from Black Velvet Seductions. The tour will run October 10 – October 28, and Heather M. Walker is available for guest post and interviews. A PDF copy of the book is available for review in conjunction with a promo post. Heather M. Walker will be awarding a hand painted set of two wine glasses, painted to resemble stained glass and a ten card tarot reading (US/Canada only) to a randomly drawn winner via rafflecopter during the tour, and a hand painted set of two wine glasses, painted to resemble stained glass and a ten card tarot reading (US/Canada only) to a randomly drawn host. In the deep south of Doltree, Georgia, not everything is what is seems. Long accustomed to life as an outcast, the beautiful and demure Annaleah Grace has learned to stand apart from the crowd with dignity. Being the daughter of a white witch and a white witch herself, living in a town of devout Christians, has earned her more than a few raised eyebrows. When she meets the handsome, yet snarky, Professor Bainbridge with whom she will be teaching at the local University, everything in her life abruptly changes. Something about him seems intimately familiar to her in a way she can’t totally identify. Even though he’s brusque and intimidating, Annaleah is drawn by his otherworldly eyes and foreign mannerisms. With the help of angels, both Holy and fallen, she discovers just how unique she truly is. Dreams become a meeting place between this reality and the next, and Professor Sebastian Bainbridge’s true identity is revealed. When her dreams begin to be more than dreams and she wakes up with Georgia red clay she walked through during a nightmare still wet on her feet, Annaleah knows something intense and powerful is going on, and that somehow, Professor Bainbridge is part of it. She is determined to embrace the profound destiny that awaits her and the Professor, even if that means taking up a sword to fight the Devil himself. I would love to host on 10/19 on Fabulous and Brunette!! I would love to have a guest post spot - thanks!! Megan Morgan can host this October 21st with a guest post. Topic: Tells us about your witchy main character. I can host on Sharing Links and Wisdom on October 12 with a Halloween themed guest post. I can do a guest post on any open date! I'd love October 10, please and thanks! For a guest post topic, I'd love any "Fun Facts/Behind the Scenes/Did You Know? "-type tidbits about the Heather, the book itself or the writing process of the book! I'd like to do an interview on Oct 11 at Reviews and Interviews. thanks! Interview. Questions should be on file. Thanks. I would like to host a guest post on 10/26/16.